Fast food can please your taste buds and is a convenient alternative to home-cooked meals due to our hectic lifestyles. However, fast food does no good other than loading you with calories. So let’s compare fast food vs. home-cooked meals in terms of their nutrition and side effects and see how they stand against one another. 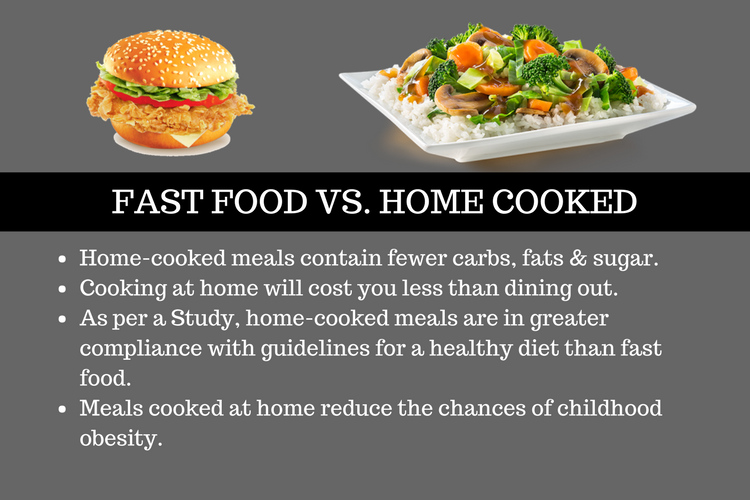 Here are few studies that compare fast food vs. home-cooked meals. According to new the Johns Hopkins Bloomberg School of Public Health research, people who eat home-cooked meals consume fewer calories than those who eat fast food. People eating home-cooked meals consume less carbs, fats, and sugar than those who cook less. The study also found that those who frequently eat home-cooked meals six to seven nights a week consume fewer calories when they eat out. They don’t choose frozen or fast foods when they eat out but eat fresh food with a good nutrition value. Income or education aren’t factors that affect eating habits. But, is home-cooked food cheaper than fast food? A paper from the University of Washington’s School of Public Health shows fast food vs. home-cooked meals comparison considering the cost. It states that people who eat home-cooked meals have a healthier diet at a lower cost. Eating home-cooked meals is less expensive compared to the amount we pay when eating out. What we pay for our monthly or weekly groceries is much less than each meal we pay for dining out. And, home-cooked meals are more nutritious than take-out or restaurant-made meals. A study published in the Seattle Obesity Study showed that people eating home-cooked meals have greater dietary compliance than those that eat out. So, this means that their weekly diet plan meets the federal guidelines for a healthy diet. The study also found that people with bigger families and more children cook their meals often. Time constraints prevent people from cooking at home. As mentioned, the education or income of a person is not related to eating at home or out. A paper published in the journal Nutrition Reviews, states that people who live alone are more likely to eat unhealthy. The reason may be a lack of cooking skills, no motivation to cook for self, no one to go shopping with, and so on. Eating home-cooked meals along with the family helps with bonding and increases interpersonal communication. It keeps children mentally and physically healthy. A study published in the Journal of the Academy of Nutrition and Dietetics says that having meals with the family decreases childhood obesity. If parents spend quality time with their children, they have a better sense of self-worth. If we compare fast food vs. home-cooked meals nutritional values, fast food is high in salt, artery-clogging cholesterol, and calories. A single meal at a fast food chain can cost you all the calories you consume in a day. A person who prepares their own meals can reduce the amount of salt and fats added to recipes. Eating fresh fruits and vegetables can help fight off ailments and prevent type 2 diabetes and hypertension. If time constraints prevent you from cooking at home, you can invest more time on a certain day and cook enough food to last for several meals. Eating leftovers is still better than calorie-dense and nutrient-deficit fast foods. Also, you should opt for fresh fruits at least once a day. Another idea is to cook simple meals with whole grains and veggies that you can make in less than 15 minutes. For instance, you can cook oats in milk and have them with fresh fruits. Or, you can chop some veggies in advance and refrigerate them for the next day so you can cook them quickly. Research has found that homemade baby food is healthier than the store-bought ones. A study published in Archives of Disease in Childhood helps parents decide between homemade and store-bought food. Store-bought baby food contains two vegetable varieties per serving, whereas home-cooked baby food may contain three or more. Home-cooked baby meals exceed the protein, fats, and calorie recommendation than store-bought food. Also, home-cooked meals have 26% more energy and 44% more protein and total fat than store-bought food. Commercial baby foods contain less protein than home-cooked baby foods. Increasing the protein content increases the cost, so manufacturers may use fewer nutrients. Commercially-made baby food has a low proportion of seafood-based products and a high proportion of red meat-based products. However, it is recommended for a child to have more oil-rich fish products and less red meat-based products. The findings of a study published in Archives of Disease in Childhood says that commercial meals provide a greater vegetable variety per meal and home-cooked meals provide six to seven percent more nutrients than commercial meals. With that said, parents shouldn’t completely rely on commercial meals for their child’s nutrition. They should maintain a balance between home-cooked and commercial meals to provide the child with a varied, nutritious diet. Home-cooked meals are lower in average cost than store-bought food. The cost of home-cooked meals is £0.33 ($0.42) per 100 grams, while that of commercial meals is £0.68 ($0.88) per 100 grams. One meal at McDonald’s for a family of four can cost $23.00 to $28.00. On the other hand, a home-cooked meal of whole roasted chicken with veggies, salad, and milk for a family of four costs about $14.00. Homemade meals of pinto beans and rice will cost even less, about $9.00. A research study conducted by the University of Aberdeen in Scotland found that people who use organic ingredients for cooking at home would pay about one-third more. But still, the cost would be less than buying comparable commercial products. 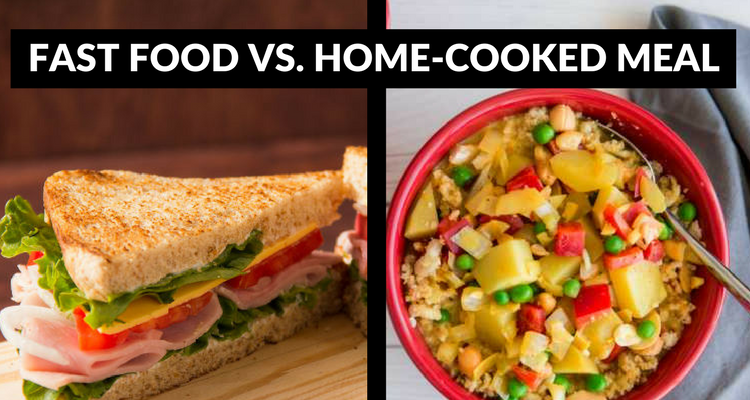 After looking at the fast food vs. home-cooked meals comparison, we can conclude that home-cooked meals are healthier and cost-effective as well. They don’t load you with calories, fats, harmful preservatives, flavorings, and salts. They go a long way in improving your overall lifestyle, health, and well-being. Having said that, you should not totally deprive yourself of your favorite store-bought foods. You can still enjoy them in moderation once in a while. “Study Suggests Home Cooking is a Main Ingredient in Healthier Diet,” John Hopkins Bloomberg School of Public Health, November 17, 2014; http://www.jhsph.edu/research/centers-and-institutes/johns-hopkins-center-for-a-livable-future/news-room/News-Releases/2014/Study-Suggests-Home-Cooking-Main-Ingredient-in-Healthier-Diet.html. “Cooking at home tonight? It’s likely cheaper and healthier, study finds,” ScienceDaily, March 14, 2017; https://www.sciencedaily.com/releases/2017/03/170314150926.htm. “Living alone can dent healthy diets,” ScienceDaily, November 3, 2015; ttps://www.sciencedaily.com/releases/2015/11/151103090932.htm. Wright, K., “3 reasons to be eat a home-cooked meal not just at Thanksgiving but all year long,” Fox News, November 28, 2013; http://www.foxnews.com/opinion/2013/11/28/3-reasons-to-be-eat-home-cooked-meal-not-just-at-thanksgiving-but-all-year-long.html. Nierenberg, C., “Homemade Baby Food Isn’t Necessarily Healthier Than Store-Bought,” HuffPost, July 21, 2016; http://www.huffingtonpost.com/entry/homemade-baby-food-isnt-healthier-than-store-bought-study-finds_us_5791068be4b00c9876ce7947. Nicols, H., “Store-bought baby food may be healthier per meal than homemade,” Medical News Today, July 20, 2016; http://www.medicalnewstoday.com/articles/311783.php. Tuttle, B., “News Flash: A Healthy Home-Cooked Meal Costs Less Than Fast Food,” Time, September 26, 2011; http://business.time.com/2011/09/26/news-flash-a-healthy-home-cooked-meal-costs-less-than-fast-food/.